“Do you have any games?” asked a boy of 5 who was visiting. Surrounded by grown-ups, lacking any kids his age to play with, he was understandably bored. I had to think a moment before responding, for it has been awhile since my home was geared for children’s activities. 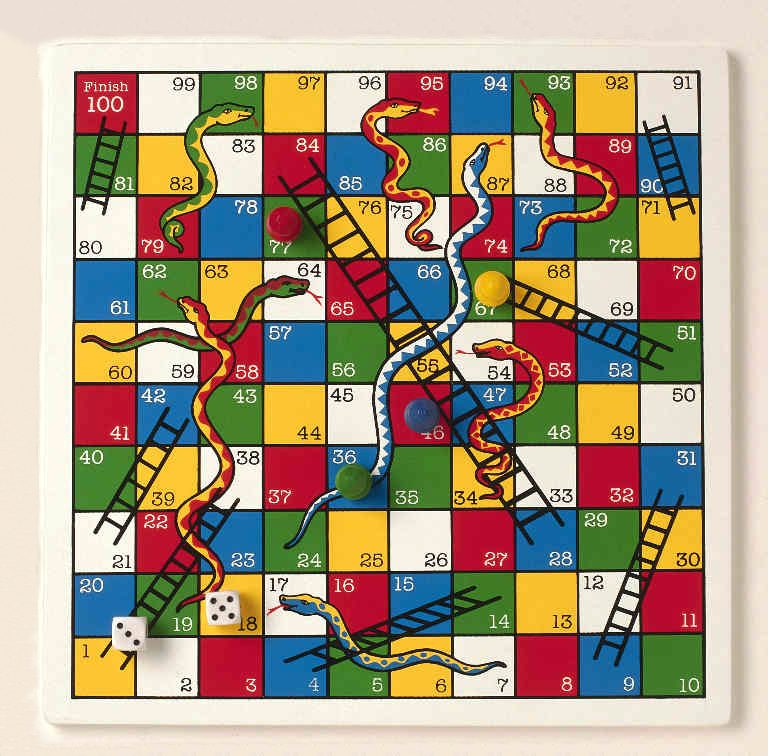 I was trying to remember where an old game of Snakes & Ladders might be until I realised – silly old me – that this child was not seeking a board game. My young visitor clearly wanted to play a game on a screen. How many of those born in the second decade of the third millenium AD have ever taken a piece of folding cardboard from a paper box, set out place-marking pieces and thrown a pair of dice? I fear that his disappointment over my inability to offer him any digital diversions may have reinforced his negative image of people my age. My New Old Self can relate. Especially now, in the holidays. ‘Tis the season for one’s children and other young relatives to visit. And be prevailed upon to help the old folk with our various tech challenges. This is an entirely different worldview from the way I was raised. My parents, like the generations before them, tended to consult people their age or older when there were problems to be solved. I cannot remember my dad wanting a teenager to fix a phone or typewriter. But that’s what it’s like when the generation gap meets the digital divide. If your laptop doesn’t work, who ya gonna call? The nearest youngster, of course. It is our fate to be growing old in this era when most people our age are historically disadvantaged. It’s the inevitable result of growing up up on the wrong side of the Digital Divide. Digital Natives are the most advantaged. Digital Migrants like us are desperately trying to learn a new language and navigate unfamiliar terrain. So it’s only natural that we reach out for help from our families – and their younger members. Warning bells should now be going off in your head. 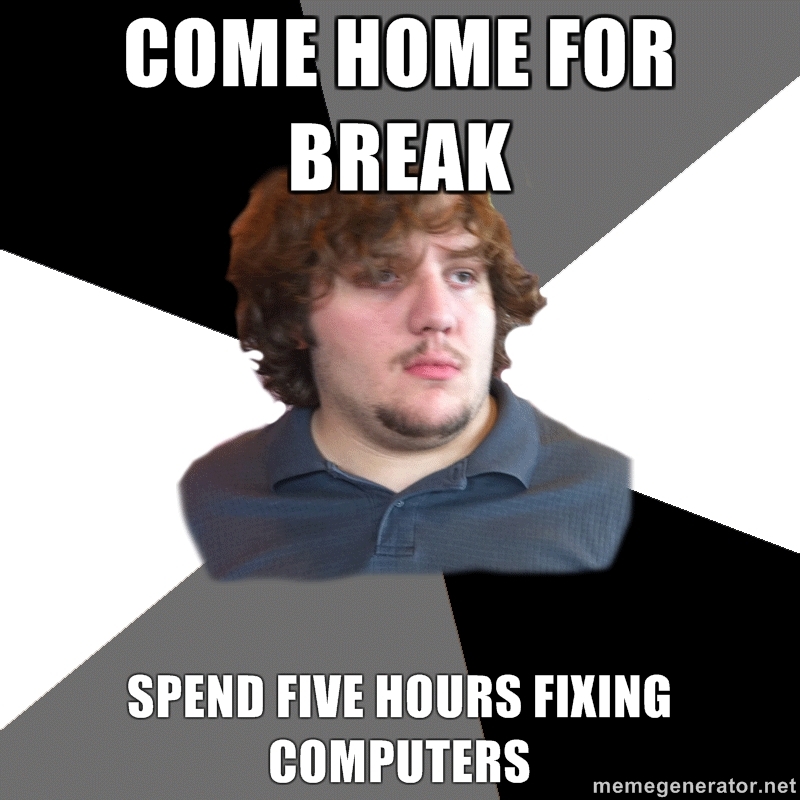 Surely, asking your own kid to fix your computer is about as ill advised as teaching your own kid to drive. That’s why driving instructors were invented. The same applies when young pups try to teach old dogs new tricks. Everyone over 50 should have access to a youth to deal with their computer and phone problems. They should just not be related. My view on interactions between older Migrants and younger Natives is informed by recent research. I discovered a number of internet forums where this dynamic is vigorously critiqued. 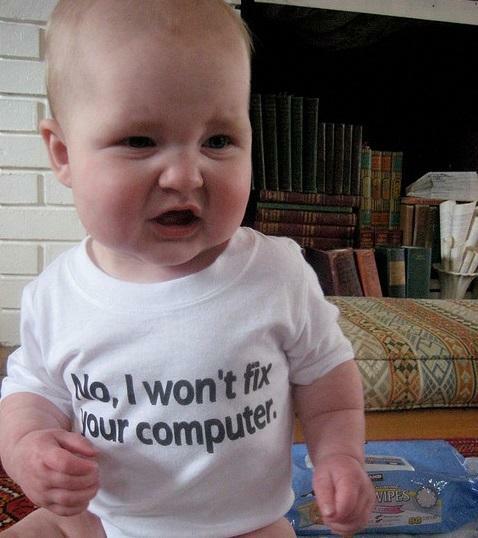 It seems that many of our young helpers are losing patience with requests to fix our computers. I’ve decided that my tech support is better outsourced. Out of the family. It’s not worth the potential strain on relationships with adult children or other young relatives. Does this exchange sound familiar? It seems that tech support companies have already picked up on the trends in consumer demand among older tech users. Some companies are reportedly trying to evoke a child-parent bond between clients and the staff of rent-a-geeks. One California company is hiring clean cut, friendly students to give older people a comforting vibe that it’s just like their children and grandchildren helping to solve their tech problems. Whatever we do to manage – or avoid – familial tech support, it will offer no lessons for posterity. This is because ours is the last and only generation to experience the challenging transition from analog to digital. We alone understand how profound and terrifying it was to make the leap from pen, paper and typewriter to computer and screen. The first Digital Natives are now having children, while Digital Dysfunctionals are a dying breed. Our children’s generation may well be the last to be able to lord their technological skills over their parents. Guilty, I’m afraid. I’m a definite Digital Dysfunctional who’s always having to consult the Family Tech Support…how I loved the ‘don’t lose the piece of paper this time’….oh so familiar. Thank god for Skype,Viber etc. now that he’s living in another country!